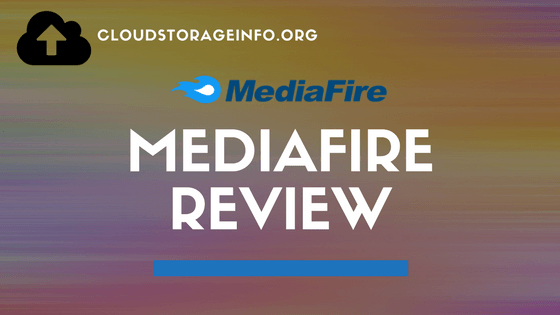 MediaFire Review: MediaFire Online Cloud Storage has 150 million users registered in their database. They offer up to 50 GB of free storage and a cheap 1000 GB plan when compared to other cloud services. Despite being one of the more popular cloud services, they have a few flaws. The interface is easy to use. However, it feels a bit slow. Their mobile application is not that well made as there are no options to download files to your mobile. Online support is also very lacking. Important: MediaFire Desktop application isn't available anymore, and there are no plans on bringing it back. It feels like MediaFire is falling behind in time. Read the full MediaFire review down below. MediaFire offers two plans that you can take. There's also a business plan with up to 100 TB of storage. However, I won't discuss that in this review. The price for the Pro plan is very cheap when compared to other cloud services. MediaFire Basic Free 10 GB The Basic version is free. However, you will be seeing a lot of ads on download and sharing pages. 1000 GB 1 TB of space with no ads and captcha codes to bother you. The size of the files you upload also increases to 20 GB. The free version of MediaFire includes short-term storage. That means that you will have to sign in once per year to keep your account. Not only that, if your files are not downloaded for a longer period they will be deleted. That, of course, won't be done without a warning - You will receive an email if your files get in trouble. If you want a long-term storage, you will have to upgrade to the Pro plan. You can download only one file at a time as a Basic user. If you upgrade to Pro, you can download more files and folders at a time. In case you're an owner of a Pro account, you receive 10 TB of bandwidth. If not enough bandwidth is available the download is going to be treated like a free account download - Meaning you will have to look at those ads again. You also lose access to bulk-downloads. 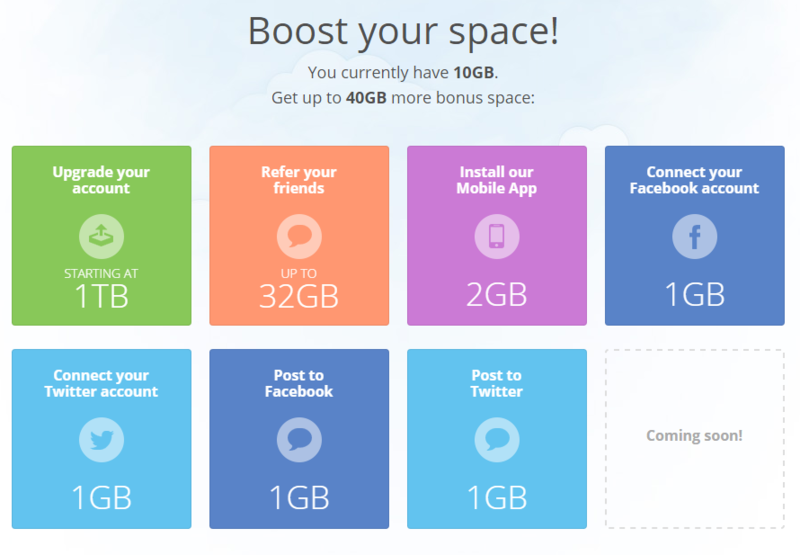 You can also increase your free cloud storage by a whopping 40 GB up to a total 50 GB. That can be done by either sharing MediaFire on Facebook and Twitter, referring your friends and installing the free MediaFire mobile app. You get 2 GB for each friend you refer to MediaFire. MediaFire is an alright choice for any average user that wishes to save some money and still have an okay cloud storage solution. However, I believe it's better to invest a bit more money and be satisfied with what you have than be sorry afterwards. 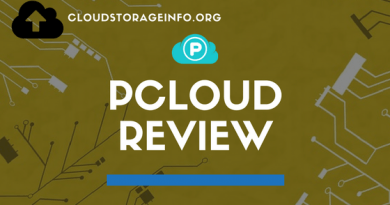 The most optimal solution for that is pCloud. MediaFire is quite easy to use. The registration process is quick, and you can even sign in with Facebook or Twitter. Once you get in 5 startup folders are automatically generated for you. You can, of course, delete them or proceed to use them however you like. The interface looks modern and nice, however, doesn't feel as responsive as it should. It takes a couple of seconds before the page loads up once you click on a folder or a file you wish to access. You can pick between two ways of displaying your files: The standard list or with thumbnails. MediaFire at the moment doesn't offer a desktop application like many other cloud services. Their desktop app has been shut down on July 30th, 2016. They have decided to do that since they're developing a new application that will make sharing and storing your files even easier. You can read more about that in this article. Important update: There are no plans of introducing a new desktop program. In my eyes, that is a huge downside, which is the reason for poor grading. You can still use your website to download and upload your files, which are then synced with all your devices. Download and upload speeds are also not the best. It took me 7 minutes to upload a 100 MB file. The maximum size of a file that you can upload is 20 GB, which is well over the size I need for personal use. You have to be a Pro user for that. If you're a free user, the biggest file you can upload is 2 GB. Sharing your files with other people is quite easy. You can either share entire folders or just separate files. 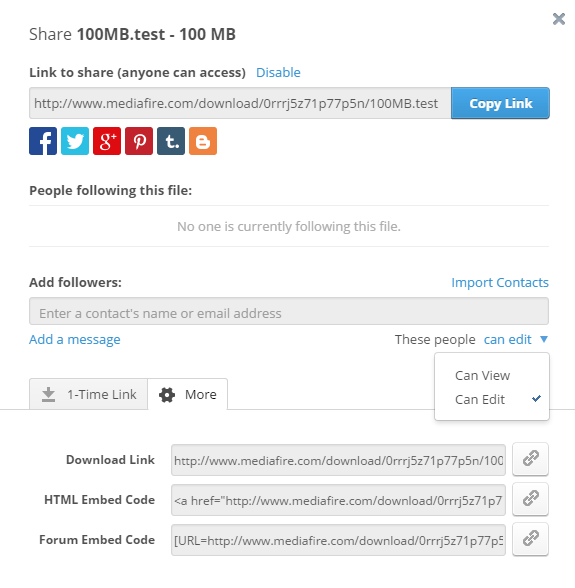 The person receiving the file doesn't have to be a member of MediaFire. You can share a file by creating a link and sending that link to your friend via e-mail or social media like Facebook, Pinterest, Google+,... If you ever decide that you don't want those files shared anymore, you can just disable the link. If you open the advanced sharing options, it creates an HTML or Forum embed code that you can post on your website, which I think is quite useful. Another useful option is that you can create a 1-time download link. This can be used out of security reasons, and I am surprised that other cloud services haven't looked at this option yet. This is the first cloud service I ran into that offers this option. I did miss the option to lock your download links with passwords, which I believe is quite important. MediaFire currently doesn't offer any file versioning which is a big downside since it can be quite useful. Files that you delete are moved to the Trash bin. You can retrieve them from there any time you want. Data will remain in the garbage bin permanently or until you delete them yourself. MediaFire for some reason chose not to provide any information about what security protocols they use. Now that is a big issue because I do believe that many of you will find that troubling. Even I am not willing to trust my data to somebody that chooses not to tell me on how he protects it. MediaFire used to have a quite decent knowledge base. However, it's not being updated anymore and is not accessible anymore. They've made a new knowledge base that contains answers to about 15 basic questions which is quite disappointing. If you run into any problems, you will have to contact them through email since that is the only option that they offer. They reply to emails in about 2-3 days which is not the best. All in all, the online support at MediaFire is very limited, so don't count on it. Roku is a media streaming device that displays content from the internet on your TV - More information. If you have a Roku device, you can stream whatever you have on your MediaFire cloud directly to your TV. You just upload the video to your PC and then watch it on television through Roku. Although it does seem like a useful thing to have, there are easier ways of watching videos on your TV. Learn more about MediaFire Roku channel here. 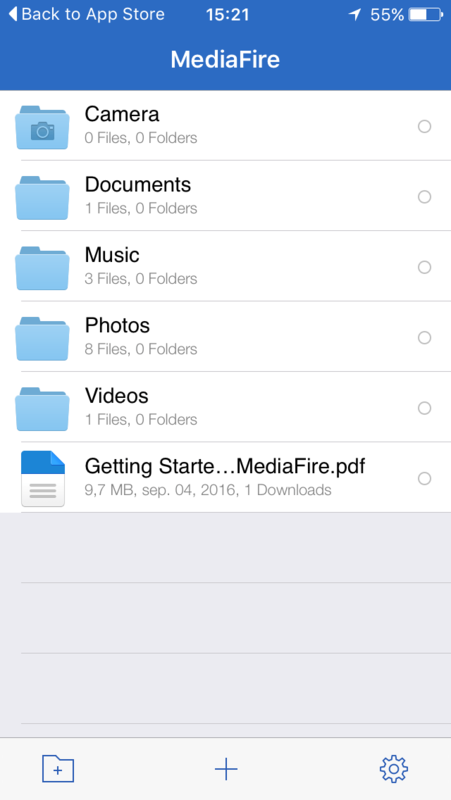 MediaFire app is available on iOS, Android, Windows Phone and Blackberry. You can use the apps to watch and edit your files that are saved to your cloud. For some reason, you can't download them directly to your mobile from the application itself, which is quite annoying at times. It almost feels like they're not your files anymore. You can share, move, rename and trash the files. It allows you to watch videos and listen to music directly from the application as well. 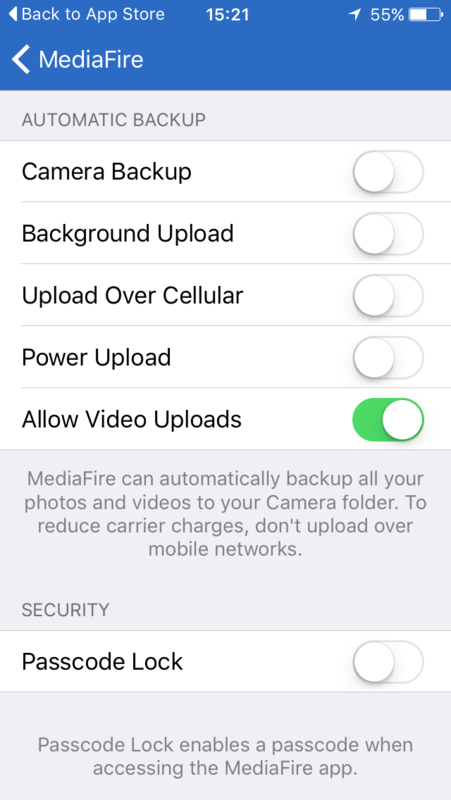 You can also upload photos from the mobile to the cloud automatically to keep them safe. The applications received a lot of negative reviews due to inability to download files and other bugs and crashes. It's not the best option out there. Hopefully, we've gone through all the little things that they offer within this MediaFire review. 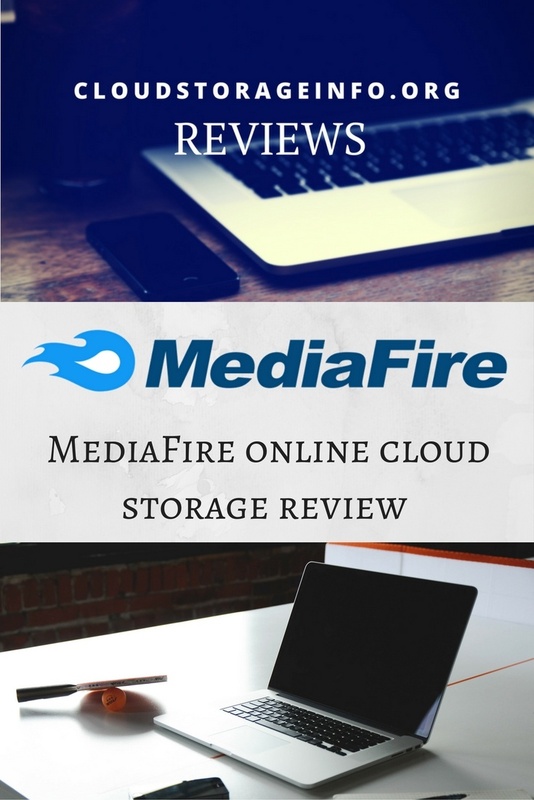 If you're searching for a cheap cloud storage solution that will save you some money, then go for MediaFire. However, in my experience, it is better to pay more for quality service and not be disappointed afterwards. If you pick MediaFire, I can't give you a guarantee that you won't run into any problems, as you probably will. My advice to you is - Pay a bit more and enjoy the benefits that come with that. 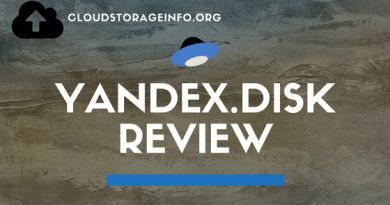 Check which cloud storage is the best here. YOUR OPINION MATTERS! Review MediaFire yourself as well by posting a comment below. Would you just like to share or ask something ? Just skip the review part! I never knew there were so many cloud storage providers though I knew about cloud storage. Your blog is very informative and has really given me a lot to think about in terms of cloud storage. It’s good to know the various options available. I once joined Tresorit years ago but never used it. It was free then. The drawback is the mobile application and problems highlighted. Thanks for this very informative review. I think many get focused on the amount of storage vs cost element without understanding all the usability issues you’ve highlighted here. There are so many cloud solutions available now that it’s quite hard to do the comparison – but you’ve cracked that here in a really understandable format. Do you think this solution is now a bad choice for new users given the multitude of other options available?? Hello there, thank you for stopping by. It is quite hard to find the best cloud storage nowadays since they all offer different features. However we can always compare them at those basic and most important ones. As I explained in the review, there are better options out there for an even price. You can check them out here. You broke down things pretty well in regards to Mediafire and Cloud storage usage. With people doing so much online nowadays and creating important different size docs, what you offer is critical to the online business person. Storage space is a definite plus! Very informative post. Like Simon, I too am not too familiar with cloud storage. I know its out there and that a lot of people are using it, but I have not had the desire or need to investigate it as of yet. I use a gmail account as my primary email, and have access to some cloud storage through google, but, once again have not looked into it. However, now do to your post, I am a little more knowledgeable about it. Thanks so much for posting. You may not know that but if you’ve been using your gmail account you’ve been using their Google Drive as well. That’s due to the fact that all the attachments you receive go through their cloud. 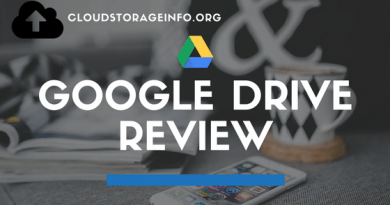 You can read the review on Google Drive here to get the better idea of what you can do with it. Thank you for stopping by. I am glad I was able to help you out. If you still don’t own cloud storage check all the pros of having one here. You can also find the best cloud storage here. Good morning to you. My name is Jim. I have a basic question about this cloud storage. 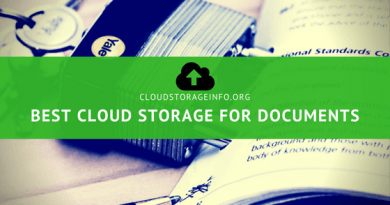 Why is it needed or desired to have cloud storage? Can’t you just backup your files in some method like a disc or memory stick. Is that simply old fashioned? Well, as it happens I already made a post of pros and cons, if you decide to get into cloud storage. You can find that post here. But in short: If you upload your files to cloud storage, you will be able to access them anywhere at anytime on any device. That is what I believe is the biggest advantage of it. You don’t have to worry about your memory sticks and hard drives. Can you open a picture that is saved on your memory stick on your mobile phone ? You can’t really. On the other hand, it’s very easy to access your pictures on your phone from the cloud. I guess having a memory stick does feel more and more old-fashioned. I hope that answers your question and thank you for stopping by. Thanks for your prompt reply. Please excuse me if I seem very uninformed, but I’m just trying to understand fully, and you seem to know all about this subject. Say you’ve got a business with lots of info on your computer. I did actually have such a business for 15 years. When we wanted to work on the business from home, like pay bills or send invoices, we’d have to make a copy at the office, and then load it onto the computer at home. It was a Quick Books program. If I would have had cloud storage, would I have simply been able to do the work at home without making a copy and bringing it home and loading it on the home computer, and then making another copy and bringing it back to work the next day? Exactly, the copy wouldn’t even exist. You would be working on that same file all the time. Plus you get the file versioning system if you pick the right cloud storage. I explained the cloud features here if you want to know more about it. Now that would have been a great help back than if I had only know about it. Thank you. I still do a lot of computer work, so I’ll keep reading all the things you suggest and learn more. I’m sure that this will b very helpful to me with my work now too. thanks again, I’ll be talking to you, Jim. I am glad I was able to help you Jim. I am here if you run into any more questions.